The beautiful and talented Rashida Jones, shown here as Ann Perkins in "Parks and Recreation" gives us a mouth configuration that, at first glance, is similar to that exemplified in an earlier post regarding Chicago Bears quarterback, Jay Cutler. The difference is quite significant though. Jay's mouth had demonstrated open consideration (a mind not yet made up, in an open non-secretive manner), but Rashida's (Ann's) mouth is closed and her mid-face is tightened. Her lips are also thinned - particularly her upper lip. This takes on a negative and critical-evaluation quality. It's very possible that a few moments before Miss Jones mouth was identical in appearance to Mr. Cutler's - but in the midst of a decision making process, something has pushed her character in the negative direction. There are certainly more extreme examples of this nonverbal (this is moderate), however I'm continually amazed by the educated, experienced and otherwise successful people who cannot detect moderate, let alone subtle body language signals. To give yourself an huge advantage, you must see the nuance - when others miss, gloss over or discount it. On a side note, understanding nonverbal communication well completely changes the way you appreciate acting and gravitate towards movies and television (and all human interaction). 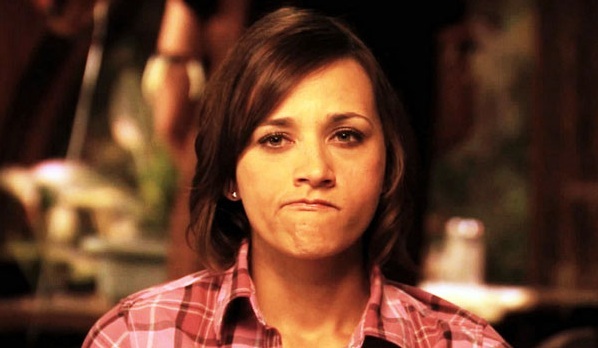 It's and educated guess - but it's very probable that Rashida is a method actor - anyone know? Most everyone can memorize a line, but great acting matches the words, the paralanguage AND the body language into a congruent communicative art and suspends our disbelief. Thank you Miss Jones.